Q. Could you explain the Quasi-Zenith Satellite System (QZSS)? The name Quasi-Zenith Satellite System was chosen because the satellites will appear at almost the zenith over the region of Japan. 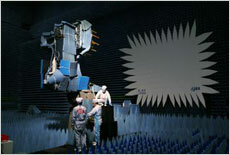 Having a satellite positioned there, it is possible to receive signals from directly above, without many obstacles. The positioning, navigation and timing information that is currently widely used in car navigation and other applications is provided by the U.S. GPS. The QZSS is the Japanese version. To carry out three-dimensional positioning through GPS, you need three position coordinates (x, y and z) and accurate time information. This means that, in total, at least four satellites are needed to measure the distance to the target simultaneously. Only then can accurate location information be obtained. However, the positions of satellites continuously change as they rotate around the Earth. When a GPS user's direct line of sight to the four satellites is blocked by a building or a mountain, accurate positioning is impossible. To solve this problem, a fourth satellite will be always positioned near the zenith over Japan, so it can have a clear line of sight at all times. As long as at least one satellite is capable of tracking an object, it can compensate when the other satellites cannot pick it up. As a result, the system works a much greater percentage of the time. The images in Figure 1 show a positioning simulation for the visibility of the Ginza area in Tokyo with four satellites or more. You can see that, in narrow streets and in the shadow of tall buildings, GPS often doesn't work. But when a quasi-zenith satellite is added, the visibility increases to 90-100% of the time. Enhancing the percentage of time that accurate positioning by GPS satellites is available to users is one of the major objectives of QZSS. Q. What kinds of new technologies are introduced with QZSS? QZSS's orbits are optimized for Japan's use. While regular geostationary satellites are placed at an inclination of 0 degrees above the Earth's equator, the QZSS satellites are inclined at about 45 degrees, so they will fly right over Japan. However, it is not the same satellite lingering above the country all the time. As the orbit is inclined, in accordance with the Earth's rotation, the position of each satellite keeps shifting slightly between north and south, which sends them back to the same location about every 24 hours. Each satellite can dwell directly over Japan for about eight hours. We will therefore use three quasi-zenith satellites, so we can ensure that there is always one aligned near the zenith. This will make round-the-clock positioning possible. This similar method has been used in other parts of the world, but this is the first attempt for Japan, and a new design was required for the unconventional orbits of these geostationary satellites. The orbits of the QZSS satellites form an asymmetric figure eight, stretching from north to south and centering on the equatorial plane, and they reach their highest altitude over Japan. This way, the satellites are able to remain over the country for a long time. The altitude is higher in the northern hemisphere than in the southern hemisphere; but the satellites must send a steady signal to the target despite the differences in altitude and regardless of their distance from the target. Development of technology to accommodate this is a challenging assignment. Q. What is the plan for the development of QZSS? We completed a critical design for the satellite system and the ground control system on schedule, in August. We are currently working on manufacturing and testing a flight model as well as preparing the ground system. In the meantime, we are meeting with staff from research institutes and the private sector to discuss potential applications. The QZSS mission is a major technology demonstration project with the participation of Japan's Ministry of Internal Affairs and Communications, the Ministry of Education, Culture, Sports, Science and Technology, the Ministry of Economy, Trade and Industry, and the Ministry of Land, Infrastructure, Transport and Tourism. From the private sector, the Satellite Positioning Research and Application Center (SAPC) will join us for application demonstration. The project has two different phases. In the first phase, we will conduct a technology demonstration and an application demonstration. After evaluating the results, we will move on to the second phase, in which we will test the round-the-clock system with three quasi-zenith satellites, including the first one launched in the first phase. At the moment, our primary goal is to get a satisfying result with the first satellite. JAXA is responsible for system development and operation in the first phase, in which three technology demonstrations will take place. The first one is about improving GPS availability. We will launch a satellite equipped with instruments that can transmit GPS-like positioning signals, and will use it as the fourth GPS satellite with a round-the-clock view. We will also be responsible for high-precision time management, which plays an important role in positioning. JAXA is developing the technology with the National Institute of Information and Communications Technology. The second technology demonstration, which is primarily led by the Ministry of Land, Infrastructure, Transport and Tourism, will be of accuracy and reliability enhancements to GPS positioning. Conventionally, a single satellite is capable of only 10-meter accuracy but, with QZSS, we aim to achieve one-meter accuracy for high-speed vehicles such as trains and automobiles. Another technology in development is for releasing information about the reliability of positioning signals from the satellites. In case there are false signals (for example, due to a malfunction of an onboard clock), users in trains or automobiles will be notified. The third technology demonstration will be conducted by JAXA and the Ministry of Economy, Trade and Industry. Its objective is to acquire next-generation core technology. We will try to establish next-generation positioning technology in Japan, not only with the same signals as GPS satellites but also with our own frequency signals. Having our own original system, even if the U.S. GPS service becomes unavailable to us in the future, we will still be able to manage, and even to create, new opportunities ourselves.